The Barbizon School was a group of painters prominent from 1830-1870. Named after the village of Barbizon, France, the painters would often find themselves gathering here, where they were able to easily draw their inspiration from the beautiful countryside. Although Romanticism was dominating art at the time, The Barbizon School was a movement towards realism. In 1824, painter John Constable�s work was exhibited at the Salon de Paris. 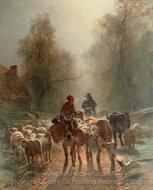 His rural scenes would become the influence for a great many of the younger artists of the time. It would move them to abandon formalism and to draw their inspiration from nature, so that nature filled their works and became the subject rather than the background. 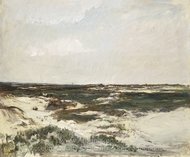 It was during the Revolutions of 1948 that many of those influenced by Constable would make their way to Barbizon, where they would come together to continue their work. 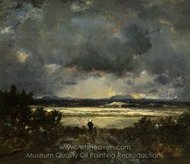 A leader in the movement, Theodore Rousseau would continue to build interest in the Barbizon style. In an era of romanticism, they would move society as a whole to a better understanding and appreciation of the realism movement and the Impressionist Landscape paintings that would follow. 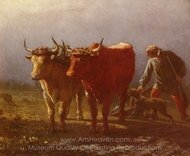 Jean-Francis Millet would add an additional element to the Barbizon School influence, by extending the idea of nature as subject, to include figures that were mostly peasants and scenes of peasant life at the time. In his 1857 painting, �The Gleaners�, he captures the essence of the peasant way of life, portraying three women, busy at work in the fields. Gleaners are the poor who would gather the leftovers of the harvest after the rich property owners had taken their fill. There is no drama in this painting, simply the subjects, and for once, the rich elite and their laborers are moved to the background. This was one of the first times that the focus was taken off the rich and prominent and those who were at the bottom rung of the social ladder placed in the forefront. In addition to their bent form, Millet also chose to let the women remain faceless, thus emphasizing their position in society. Trained by Millet, William Morris Hunt was the first American known to work in the Barbizon style. Hunt would come to be the leading painter of mid-19th century Boston, and the William Morris Hunt Library of the Boston Museum of Fine Arts has been named in his honor. Much like the artists of the Ashcan School movement painting the dreary scenes of life in New York City in the early 20th century, the earlier Barbizon painters glorified the hard work and hard lives of their subjects and were devoted to depicting the working class of their time. Influential in the development of the Impressionist movement, The Barbizon School would reach its peak in 1870.